Cats and Christmas. Just the thought can give some of us chills. But with planning, Christmas can be safe for the cats and fun for all of you. These tips will help the whole family enjoy the holidays. It’s so tempting: That big, beautiful tree just begging to be climbed, and all those sparkling, dangling balls are almost impossible to resist. So how do you keep your carefully decorated Christmas tree safe from the cats? Try these suggestions. Put the tree in a heavy stand so it’s stable and can’t be knocked over. Screw a hook into a wall and attach a string to both the hook and the tree. Or screw the hook into the ceiling and connect the string to the hook and the top of the tree. Before you decorate the tree, spray it with Bitter Apple. You won’t notice the smell, but the cats will hate the way it tastes. Use an electronic deterrent, like a ScatMat, which causes a tingling sensation when stepped on. Other electronic deterrents that are safe for cats include devices that emit a blast of air or make a high-pitched noise that only cats and dogs can hear. Or try putting pine cones around the base of the tree. While they’ll look festive to you, the cats won’t like walking on them. Leave the bottom third of your tree undecorated or use unbreakable ornaments and tie them on with twist ties. Don’t put tinsel where the cats can reach it. It can be a choking hazard. Tape down excess wire from the lights or wrap it around the base of the tree. Dangling wire can look like an enticing toy to a cat. Put a corrugated cardboard scratcher near the tree. Use an inclined scratcher and sprinkle it liberally with catnip to give the cats something even more fun than the tree to sink their claws into. My favorite idea: Give the cats their own little tree with lots of dangling kitty-safe ornaments to bat around. Make your own, or buy felt ornaments and remove all the tiny pieces that could be a choking hazard. The holidays are rife with hazards for cats, but poinsettia plants aren’t among them. The colorful holiday favorite has gotten a bad rap, according to the ASPCA’s Animal Poison Control Center. While eating a poinsettia plant can cause “mild gastrointestinal irritation,” the Poison Control Center says, poinsettia leaves are not lethal. The holiday plants that really are toxic to cats: Holly and mistletoe. Chocolate contains theobromine and can be deadly to cats. If you suspect your cat has eaten chocolate, contact your veterinarian or animal emergency clinic right away. Alcohol contains ethanol, which can also be deadly for cats. If your cat takes a sip of your eggnog, watch for such signs as staggering, excitement or decreased reflexes. If you even suspect alcohol toxicity, your cat needs to see a veterinarian immediately. Pine Needles are toxic to cats and can puncture internal organs if eaten. The water in the Christmas tree stand can also poison your cat. Make sure it’s covered! 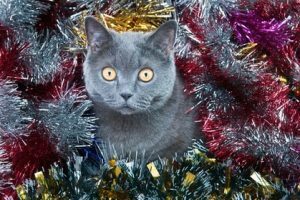 Tinsel can be a choking hazard and can cause an intestinal blockage if swallowed. Artificial snow is also toxic to cats. Cooked turkey bones can splinter and lodge in your cat’s throat or puncture internal organs. Onions can cause Heinz body anemia, which destroys the red blood cells. If your cat has turkey for Christmas dinner, serve it without the gravy. Ribbon, like tinsel, can cause an intestinal blockage if swallowed. Scented candles contain essential oils, and many are toxic to cats. Making Christmas safe and fun for cats just takes some planning. If you think ahead, all of you can enjoy a stress-free holiday together.